October is a busy month in Northwest Arkansas! 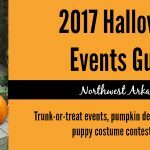 There are tons of regular events in addition to all the Halloween fun! Click here to see our big Halloween Events/Activities Guide. Bring your infants aged 6 to 17 months old for activities that encourage physical growth, social-emotional development, and emerging language skills. A new topic is explored each month. The fee per child/adult pair is $10 for Amazeum members and $15 for non-members. Advanced registration and payment is required. The final First Thursday of 2018 is taking over the Fayetteville downtown square on Thursday, October 4 with GLO. Decorate your bike, your skateboard, or yourself and get ready to let your light shine. As always, this event is FREE and open to the public. GLO: Body Marbling with Black Light Visuals; Slow Roll, Glow Ride with BikeNWA; Glow your bike from 5:00 – 7:00. Slowwww 3.5 mile all ages group ride from 7:00 – 8:00. No bike, no problem! VeoRide Bike Share bikes will be available to ride. A giant block party on the Bentonville Square featuring 412 West. There will be a lot of bikes in partnership with Bike Bentonville‘s weekend extravaganza. Come enjoy friends, family, street food, music, vendors, BIKES and all of Downtown at once. Enjoy the beautiful autumn scenery and weather during the first weekend of October in this fun, relaxing event centered on America’s Sports Car, the Corvette. Time: “Rides for Kids” hosted by the Central Arkansas Corvette Club will take place at 1 p.m., Friday, October 5. The Owners Choice Auto Show is 9 a.m. to 1 p.m. Saturday October 6. Enjoy an evening of fast-paced trivia, good food and drinks at the fifth Trivia Night benefiting Micah’s House NWA. All ages are welcome to join the fun. Tickets are $20 per person. A street festival showcases locally handmade goods, curated vintage items, food trucks, and live music. This one-day festival celebrates the creative, curious and innovative spirit in all of us. The Scott Family Amazeum event is included with paid admission or membership and designed for ages 4 and up. It brings together makers, artists, tinkerers, craftspeople, educators, and creatives to showcase their work while inviting families to join in the Do It Yourself fun to learn from each other. It’s a great family activity where all can experiment. Returning this year is the popular car-take-apart activity. Other stations include 3D printing, technology dissection, upcycling and interactive activities created by students at regional schools. Visiting musicians Cherokee songstress Kalyn Fay from Oklahoma, the Orchestral Pow Wow Project directed by Cris Derksen, and renowned hoop dancer Nimkii Osawamick incorporate Indigenous artists through dynamic live performances. 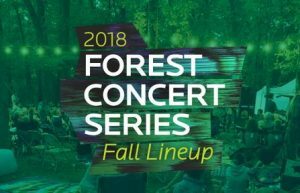 This is the final forest concert of the season and celebrates the opening of the special exhibition, Art for a New Understanding: Native Voices, 1950s to Now. Museum members and kids ages 18 and under are free, but a printed ticket is required for entry. Tickets are $10 each for non-members. You can reserve these tickets online or with Guest Services at 479.657.2335. Classic cars, hot rods and other cool rides gather each first Saturday of the month in downtown Springdale (this is the final event for 2018). The event is free, and so is the Dunkin’ Donuts coffee. Location: Downtown Springdale 203 E. Emma Ave. Springdale, in the HelpCard parking lot. Angelo is back with Drumming in the Park. Bring your drum to Basin Spring Park to join in the fun. Everyone is encouraged to sit in on the drumming circle. This American music series is a free event sponsored by Land O Lakes at Starr Theater. Fill your day with happiness and music while celebrating Hispanic Heritage month. This free event is an opportunity to savor some delicious samples, meet and greet artists and engage in some fun activities for the entire family. 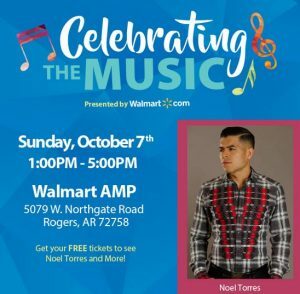 Mexican singer/songwriter and accordionist Noel Torres will perform music. Tickets are required. Step back in time at the Historical Van Winkle Hollow Site for this family fun event. Witness a saw miller, flint knapper, Civil War surgeon, blacksmither, and more. All of these family activities are free and open to the public. Please park at the visitor center parking lot. A free shuttle will run constantly between the visitor center and Historic Van Winkle Hollow. For more information, call 479-789-5000. Location: Van Winkle Historic Site and Visitor Center 20201 East Hwy. 12 Rogers. Hobbs State Park visitor center is located on Hwy. 12 just east of the Highway 12/War Eagle Road intersection. Kids enter free to Oktoberfest 2018, which features food trucks, local art, vendors, performances by Lost John and White Mansion and of course 100% Arkansas Beer. Admission for those 21 and over are $10. Those 18 and over with a designated driver are $5. These workshops are perfect for toddlers aged 18-36 months and their caregiver to learn and grow together. Special hands-on playtime will develop language, big body, and fine motor skills. A new topic is explored each month. Fee per child/adult pair is $10 for Amazeum members and $15 for non-members. Advanced registration and payment required. This year’s festival features music Thursday through Sunday, October 11-14. The musical line-up includes Railroad Earth, Trampled by Turtles, Sam Bush, The Wood Brothers, Billy Strings, Split Lip Rayfield, Arkansauce, The Mighty Pines, Miles Over Mountains and more. Vendors will be onsite. Camping supplies, food, and water are available for purchase at the on-site general store. RV sites are sold out this year, but other camping locations are available. Audiences will be able to relive the magical adventure of Harry Potter’s second year at school like never before. 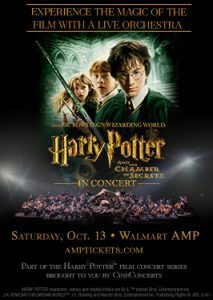 This concert features Harry Potter and the Chamber of Secrets™ in high-definition while a live orchestra performs John Williams’ otherworldly score. Experience the wonder of talking spiders, scolding letters, and giant snakes all over again! Tickets are $22 each for general seating. Time: Gates open at 5:30 p.m., film starts at 7 p.m.
“Fly me to the Moon,” or at least get as close as possible. OzarkSTEAM Foundation will be here to help kids build and test rockets. Participants will learn foundations of the scientific method while predicting how high and how fast the rocket will fly. They’ll learn how important the fins are to the flight of a rocket. Celebrate the coming of fall at Devil’s Den. Design a homemade costume and then join in the walk around trick or treating, crafts and fun programs during this weekend for the whole family. Featuring arts & crafts booths, live music, games, great food, and free entertainment throughout the day. Tales of murder, mischief and mayhem on this hair-raising walking tour. Some of the stories are mysterious and some are tragic, but they are all true. Tickets can be purchased at Eventbrite.com and space is limited. Come along for this educational 45 minute walk around part of downtown Rogers. Registration required and admission is $5. Time: Tours are nightly every 15 minutes from 7 to 8 p.m.
Children aged 3-5 years old and their favorite adult will become keen explorers of their world in this collaborative experience filled with engaging activity zones that inspire curiosity, skill-building and new ideas to grow on. The fee per child/adult pair is $10 for Amazeum members and $15 for non-members. Advanced registration and payment required. Guided, living history tours of the Eureka Springs Municipal Cemetery will be given by actors in period costumes. They will share stories of their characters’ unique, colorful pasts, the founders of Eureka. These are one-hour walking tours through the cemetery. Free parking and free shuttle service is provided to the cemetery. Time: Starts at 5:30 p.m. from the parking lot of the old Victoria Inn. It leaves every 20 minutes until 8:30 p.m. The final game of the 2018 NWA Roller Derby Season will showcase skaters in a co-ed game. Come watch skaters from around the region and stick around after the game to get pics with your favorite Northwest Arkansas Skaters. Time: Doors open at 5 p.m., first whistle at 6 p.m. Gather for a fundraising and awareness event called #WalkForFreedom. Global anti-human trafficking organization, A21, operates the walk to raise awareness about the millions of men, women and children who are still trapped in slavery today. The hope is that this event will be the catalyst for the rescue and restoration of human beings who are being exploited. This fun, inspiring event unites families, friends and communities in the fight against Parkinson’s disease. Each event features our unique Movement Pavilion with yoga, Pilates, Tai Chi, dance and other activities to help manage Parkinson’s symptoms. Based on the hit film, this hilarious new musical follows Dewey Finn, a wannabe rock star posing as a substitute teacher who turns a class of straight-A students into a guitar-shredding, bass-slapping, mind-blowing rock band. This high-octane smash features 14 new songs from Andrew Lloyd Webber, all the original songs from the movie and musical theater’s first-ever kids rock band playing their instruments live on stage. The show is recommended for ages 10 and up. Tickets start at $38. 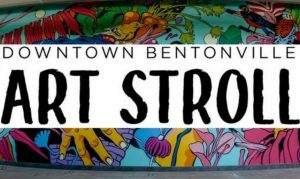 Time: Various performances starting at 1:30 p.m., 2 p.m., 7 p.m., 8 p.m.
Come to downtown Bentonville and celebrate the arts at local galleries and businesses as they invite you to enjoy special art exhibitions, performances, live music, treats and more. Do you collect or enjoy antiques? Bring a favorite item, a mystery piece, or just yourself and join our round table discussion group. No appraisals, please. The last Finders Keepers meeting of the year, a round table for collectors and antique lovers, will take place at 1 p.m. on October 26 at Hailey Building, in the Conference Room. 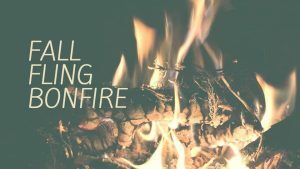 The best memories are made around a bonfire with family and friends. 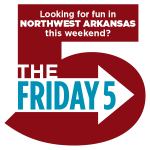 The Ozarktober Fest Fall Fling in Downtown Springdale is a 4-day event with live music, food, pumpkin decorating, FREE activities, and $5 hayrides that will take you from the rodeo grounds to the hub of Downtown Springdale near Shiloh Square and back. There are several fun activities going on in Downtown Springdale on this evening, and the hayride will allow you to shuttle among them from 6 p.m. to 9 p.m. This special program is for the museum’s youngest visitors, infants ages 3 to 24 months and a caregiver. Spend time in the galleries looking at and talking to your baby about art before enjoying sensory playtime. 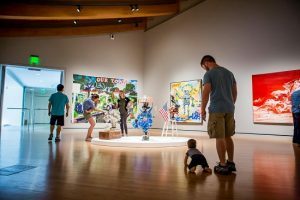 Make sure you are able to hold your baby or have them in a front carrier; they need to see and physically react to the artworks. This is a time to bond with your baby, so please make other arrangements for any siblings. The event is $10 and $8 for Members. Register online or with Guest Services at 479.657.2335. Re-live a haunted Devil’s Den story as you make your way through a ghostly part of the park. Light refreshments will be provided. There is a small fee for this haunted adventure. You may register at the visitor center. Don’t be a scaredy cat during this family-friendly nighttime fundraiser. Join the Refuge as they turn their property into an open-air haunted house, brooding with lions, tigers and the occasional princess. Costume contests, games, giveaways, hayrides, and nocturnal animals await you for the only time of year the Refuge is open during the dark of night. Meet Mother Nature’s forest friends. Listen to each animal and learn how you can make their lives better. This is a free, fun, non-scary treat for the whole family. Tours begin every 20 minutes. Strollers and wagons are welcome on the park’s half mile paved path. Calling all tween photographers: bring your phone or other photo-taking device and join L.A. artist Genevieve Gaignard for a fun workshop all about taking the perfect portrait. Explore the exhibition Personal Space with Gaignard, which includes her installation Black is Beautiful. She will help you set up your own photography studio to capture each student’s unique personality. Be sure to bring a couple props for your turn in the spotlight. A limited supply of photo devices will be available. It’s free, register online or with Guest Services at 479.657.2335. Have a ghoulishly good time in the forest at Crystal Bridges. Enjoy pumpkin painting (pumpkins provided), candy, and a special photo-BOO-th. The event is free, and no registration is required. November Calendar of Events + Last-Minute Halloween Activities! Giveaway: Win tickets to see The Illusionists magic show at Walton Arts Center!